Surf_Translucent_Envelopes is rated 5.0 out of 5 by 2. Do you send samples? my work is looking for something like this and it would be very high volume if you can do the sizes we need. Hello. Yes, we send samples! Please see your email for additional details. If everybody had an envelope, across the USA, then everybody'd be surfin' like Californi-a. The Beach Boys definitely knew what they were talking about when they sang about our Surf Envelopes! The cool, light blue oozes the same calming effect as the California coastline, making your invitation that much, well, more inviting. Just like seeing through the clear ocean water, these translucent envelopes have a delicate sheer quality that makes the inside content semi see-through and instantly captivating. 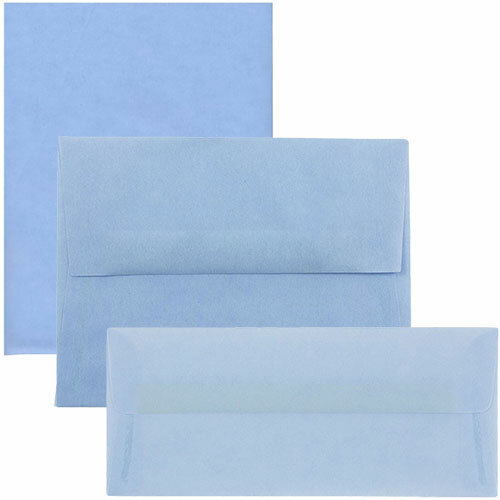 Whether you're using these envelopes for your beach themed wedding invitations or you're using them for a summer party, these beautiful blue envelopes will make anyone want to ride straight to the date. Equipped with a straight flap for a modern edge, these surf envelopes will make waves even before they open what's inside. Everybody will be going surfin', surfin USA with these envelopes!